With link localization tools like Geniuslink, earning international commissions can often seem like the easy part. It’s actually getting those international commissions into your bank account that can often become the real challenge! Unlike the iTunes affiliate program, getting money from some international affiliate programs requires a bit of extra work. For example, Amazon’s international Associates programs sometimes pay commissions in a local currency paper checks and sometimes they will only direct deposit to a local bank! This post is dedicated to all of you that have spent too long waiting at your bank to deposit your foreign currency checks (and to find out the fees were ridiculous)! Our goal today is to share some of our experiences and lessons learned from working with international payments for nearly a decade now as well as give an overview of how international payments are made from the numerous Amazon Associates programs, how to make working with your local bank account a little easier and, most importantly, some alternatives that can save you time, money and a headache. At a high level, Amazon is a global juggernaut and their e-commerce offering is currently a combination of 14 regional storefronts and 13 independent affiliate programs (the Netherlands has an Amazon storefront but not an affiliate program). Each of those independent affiliate programs is necessary to earn international commissions in their corresponding store. Payment via a gift certificate to the local Amazon storefront. We used this option for quite some time for our Amazon Japan commissions. Payment by direct deposit. This is obviously the best option for those that are reliant on their affiliate commissions but unfortunately, most of the programs will only pay out to a local bank. Payment by paper check (in the local currency). This is not an ideal option but for most, it’s the only option to collect on their international checks. For the Amazon.com (US) and Amazon.ca (Canada) affiliate programs you have the option to be paid by a local gift certificate, you can get a direct deposit to a local bank (eg. the bank has to be based in Canada for Amazon.ca payments or based in the US for Amazon.com payments). You can also be paid out to an international address via a paper check in the local currency of the store (USD or CAD respectively). For the Amazon affiliate programs in the UK and Europe (Amazon.co.uk Associates, Amazon.fr Club Partenaires, Amazon.de PartnerNet, Amazon.it Programma Affiliazione and Amazon.es afiliados) you have the standard option of a gift certificate but for direct deposits you can now select a bank in one of 47 different countries (but the US nor Canada are options!). They will also pay out via a paper check (in either Great British Pounds or Euros). India’s Amazon Associates program will only payout in via a direct deposit (aka “NEFT”) to a local bank account. With no gift certificate or paper check option, Amazon India’s affiliate program is one of the most challenging ones to see commissions from (Spoiler alert – we’ve got a solution for that, see below!). Mexico’s Amazon Afiliados program is also limited to payments via direct deposit to banks located in Mexico and that support “CLABE” accounts. International payments are rumored to be in the works! Brazil’s Amazon Associados is also limited to making payments to a Brazilian bank by direct deposit and using the “FEBRABAN” system. The Amazon Japan affiliate program offers bank transfers to a local Japanese bank but also offers Amazon.co.jp gift certificates. For many years we used our accrued Amazon Japan gift cards as a holiday gift/scavenger hunt for our team that always yielded some awesome gifts (details on how to take advantage of Amazon Japan gift cards can be found in our blog). The Amazon China affiliate program only does direct payment to a local Chinese bank (and starts at 100 yuan). The brand new (launched May 2018) Amazon Australia Associates program pays out via direct deposit to Australia based banks as well as sends local currency paper checks internationally (similar to Amazon.ca and the five affiliate programs in Europe). US / Amazon.com payments were made directly via direct deposit. Canada, UK, Germany, France, Italy and Spain payments were made by paper check and were in Canadian dollars, Great British Pounds, and Euros (respectively). Our bankers hated us for that but more on that in a minute. Japan payments were made via gift certificate that we cashed in over the holidays for presents for the team. For Mexico, Brazil, India, and China we were earning international commissions but not actually able to do anything with them. They just sat and accrued. …but this has all changed and more details on that below! As a quickly growing company, our bank is super important to us (well, about 95% of the time). However, as we alluded to, our bank failed and failed again to make us feel loved when dealing with our international foreign currency checks. The normal experience was something like this — We’d wait a month or two (sometimes longer!) and often end up with a stack of Amazon commission checks from around the world, that needed to be deposited, and we’d duck out of work a little early on a Friday to go to the bank. we’d get there and then wait in line. Once we got to the front we’d then start explaining to the first bank teller that we needed to deposit these foreign checks. They would get about five minutes into processing them and get stuck. We’d then wait for the branch manager to become available to help out. Then the two of them would stumble through trial and error process of depositing them. We’ve waited over an hour at times for them to deposit eight to ten checks! Uggg. 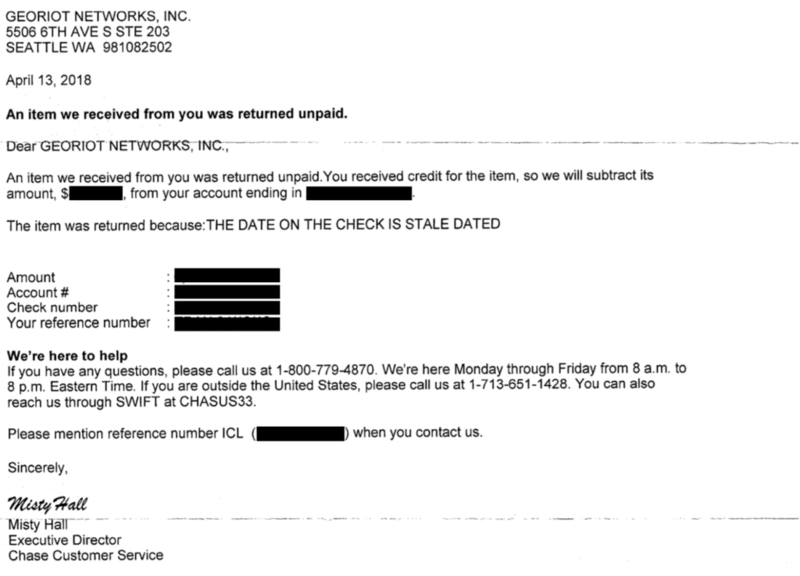 Once they finally got my checks deposited we would sometime even run into more issues where our checks would need to go to “collections” which then incurred extra fees and the money wouldn’t be available for a month or longer! It really seemed like they didn’t want to be bothered with my money. We were frustrated, they were annoyed, it wasn’t a good situation. After suffering through this process for a few years we started to learn things that can hopefully be helpful for you (if you have no better option than depositing your foreign currency checks at your bank…). Build a relationship with your banker! Getting pulled out of the back of the line to go work directly with the manager there is worth its “wait” in gold. Certain countries/currencies require extra work. Canadian dollars (CAD), Great British Pounds (GBP) and Euros (EUR) are not ones that require this extra work. The amount of the check/deposits is over a certain threshold. This is what has got us in trouble in the past. Our bank (as do most), have a “courtesy” limit on the amount you can deposit per foreign currency, in a certain time period, where the deposit will be treated like any normal local currency deposit. We found out that for personal accounts you could deposit $5,000 over 10 days. For our business account this “courtesy limit” was actually $25,000 (over 10 days). The best part is that by building a relationship with your banker you can actually request that they increase your “courtesy limit” to better match your cadence of depositing foreign currency checks! We also learned that the extra fees and delay in getting the money came from them having to physically send the check back to the bank that it originated from and that bank then has to convert it into your local currency (USD in my case) and, of course, charges a fee for this which is passed on to you. Each bank has its own fee and the speed at which it’s resolved can vary depending on the mailing/shipping option that is used. 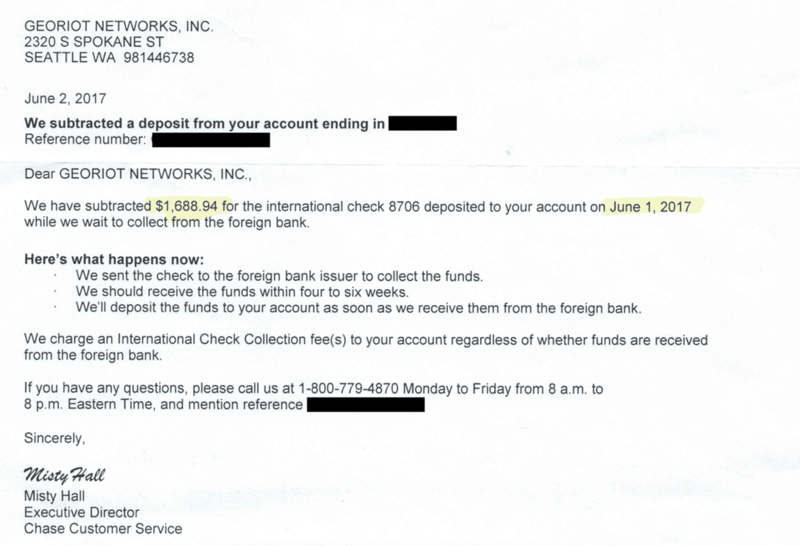 Further, we learned the hard way that an international check will go “stale” if you don’t deposit it within six months! A stale check can’t be cashed – it is returned from the issuing bank and there is nothing your local bank can do about it. See the letter we got about this directly below. You can, however, contact the support team for the Amazon affiliate program that issued the check and ask for it to be reissued (that, thankfully, is a fairly painless process). Most major banks have a department that specializes in dealing with foreign currencies and actually connecting with these people can be a game changer! In case you are curious, the number for Chase is 1-800-779-4870. Our biggest takeaway from the countless hours of waiting at the bank is that having a good bank is super important for all of your normal business reasons (establishing credit, doing payroll, paying off credit cards, depositing local checks, etc.). BUT it’s perfectly okay to cheat on your bank and use something else when dealing with international payments. We’ve been exploring how to do better foreign currency exchange and deposit options since we first started earning international commissions, all the way back in 2009. We feel like there are finally some options that are completely legal and do a great job. I’m excited to share those with you! With each of these services we’ve been in close contact with them for quite some time and done tests (putting our international commissions on the line!) to confirm they are legit and do exactly what they say. 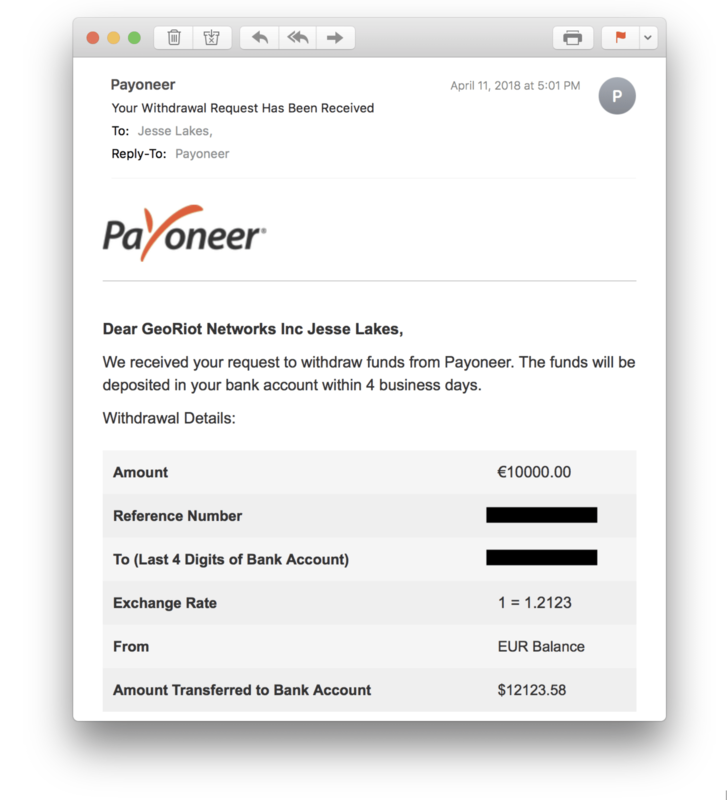 Payoneer has done a great job picking up the torch from Paypal and taking global payments (both sending and receiving) to the next level. We now use Payoneer to quickly and easily collect most of our international Amazon affiliate payments and then seamlessly transfer them into our US-based bank account. No more waiting in lines for me to deposit foreign currency paper checks! Since 2005, New York-based Payoneer has been very focused on helping out international sellers on Amazon (FBA) and we are now starting to see them gain more attention to the affiliate landscape. What makes Payoneer unique, compared to a service like PayPal, is that they provide local bank accounts in their local formats to easily interface with various payers/collectors. This “Global Payment Service” feature is what we now rely on to quickly get international commissions out of the Canada, UK, France, Germany, Italy, Spain, Japan and Australia affiliate programs and into our US-based bank account. The premise is fairly simple — after creating an account with Payoneer we have access to several international “receiving accounts”, there are essentially a collection of the relevant banking details, like account number, branch name, etc but for bank accounts that are local to UK, Japan, Canada, etc. We then use the banking details of those accounts when we set up the payments for each of the international Amazon affiliate programs (that require paying out to a local bank account). With these local receiving accounts, we can choose the option for a direct payment then input these details. connecting it to your international Amazon affiliate programs! Now each month we get an email from Amazon that they made their payments. 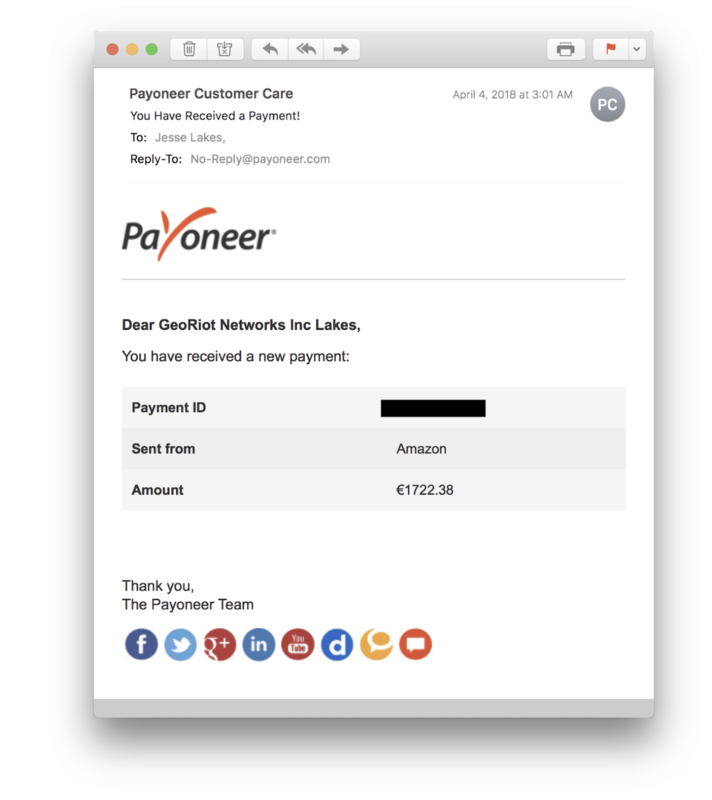 And a few days later we’ll get an email from Payoneer alerting me that we’ve received a new payment into our Payoneer account. Once the payment has been made and is in our Payoneer account we can initiate a withdrawal into our bank account, in our local currency, at any time! We just select the currency we have a balance for, select the bank we want the money sent to, the amount to transfer, leave ourselves a note and we’re good to go. The money then shows up in our bank account a few days later. The simplicity of the process makes us very happy for a few reasons. We don’t actually have to deal with any tellers or wait in any lines! We’ve created a step by step guide that gets you set up with a Payoneer account and walks you through updating your payment settings in the various Amazon affiliate program dashboards to start receiving your international Amazon affiliate commissions into your Payoneer account. 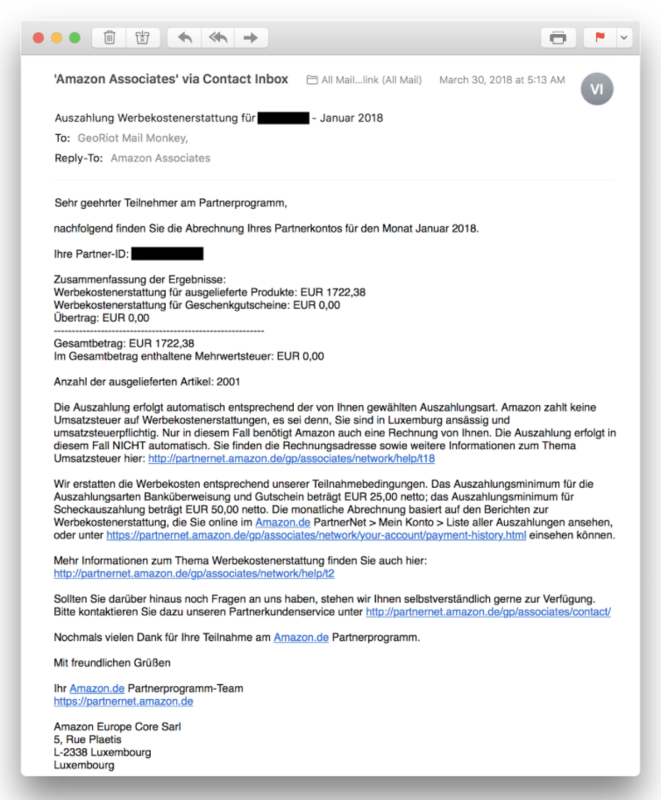 While Payoneer works great for receiving commission payouts from Amazon.com (US), Amazon.ca (Canada), Amazon.co.uk (UK), Amazon.de (Germany), Amazon.fr (France), Amazon.es (Spain), Amazon.it (Italy), Amazon.cn (China), Amazon.co.jp (Japan) and Amazon.com.au (Australia) it, unfortunately, doesn’t (yet!) work with Amazon.com.mx (Mexico) and Amazon.com.br (Brazil). Rumor on the street is that support for Mexico is rapidly approaching. Further, we’ve learned that Payoneer isn’t able to get payments out of India (Amazon.in), however, they can easily transfer money into the country. This means we can’t use Payoneer to get paid any commissions earned from Amazon India (Spoiler alert, we have a solution of Amazon India outlined directly below!) but someone residing in India can certainly use Payoneer to get international commissions out of the US Amazon.com affiliate program into their local Indian based bank account. If you haven’t signed up for a Payoneer account yet, we’d strongly encourage you to do so now (click here to start – we’ll wait) and get started connecting your global Amazon affiliate accounts (Step-by-step Payoneer guide for Amazon Associates). We first met Jimish and Mehul Jobanputra early in 2018 at the annual Affiliate Summit West conference and we quickly discovered that they had something that was going to make a lot of our clients happy – a solution for getting Amazon.in affiliate commissions out of India! But first, let us take a few steps back. Amazon.in is a huge storefront, serving a massive population, and with significant growth expected in the coming years. But as mentioned earlier, the Amazon India Associates program requires a local bank account for paying out commissions via direct deposit. From our research, to open up a local bank account in India you need to create a local business entity and that gets complicated and expensive fast. These challenges keep most creators and affiliates from taking advantage of monetizing their India based audience and thus leaving money on the table. Missing out on those Indian Rupees has frustrated us for quite some time. After years of research and looking at various processes specifically for India, we’re happy to announce we’ve found a way for non-India based clients to not only earn commissions for sales on Amazon.in but to also get those commissions paid out directly to their local banks! We’ve partnered up with Jimish and Mehul’s company Cuelinks to achieve this! Cuelinks is a “super affiliate” aggregator, similar to Skimlinks or VigLink, where you can use their tools to leverage many different affiliate programs without actually having to sign up for and manage the links for each. Think of them as having great “breadth” (supporting lots of different retailer’s affiliate programs) where Geniuslink is focused on “depth” (focused on only a few retailers but supporting all of the regional storefronts and affiliate programs). Cuelinks is based in India and is focused primarily on the Indian market. And, most importantly, they can also make payments to their clients even if they are international! At a high level, the process to start earning commissions in Amazon.in is a little different. Instead of signing up for an Associates account directly from Amazon.in you sign up for an account with Cuelinks instead. They then provide you with an Amazon.in tracking ID that you add into Geniuslink. This ensures that clicks on your geni.us links from India can be translated into an affiliated product link for the Amazon.in store using your Cuelinks issued Amazon.in affiliate tracking ID. to start earning commissions in India! Before you ask, the answer is “Yes!”, we’ve been in very close contact with the Associates team at Amazon.in to ensure this process doesn’t violate any of their terms of service. We also continue to send monthly updates to the Amazon India team to provide complete transparency and continue to ensure a great working relationship. It’s important to note that while leveraging Cuelinks to get your international Amazon affiliate commissions out of India is fairly simple to setup and use it is not “free.” In fact, it’s actually fairly “expensive” to get money out of India due in large part to the high taxes extracted during the process. Also, similar to their peers VigLink and SkimLinks, Cuelinks takes a percentage cut for processing. After all the taxes and fees (which Cuelinks seamlessly handles) you can expect about 50% of your commissions to be deposited directly into your bank account. Compared to Payoneer this may feel like a lot. However, we like to frame this as it still “found” money and 50% of something is way better than 100% of nothing (and also way better than 0% of something). If you have even a few hundred clicks a month coming from India we’d encourage you to sign up for a Cuelinks account yet (don’t worry, we’ll wait) and get started connecting it to your Geniuslink account (Step-by-step Cuelinks guide for Amazon Associates), those Rupees start adding up quickly! Maximizing your international commissions and monetizing your long tail of international visitors is a huge first step in “leveling up” as an Amazon Associate. But actually getting those international affiliate commissions into your bank account is an important next step and necessary for completing the loop. This classifies as “prestiging“! What used to be riddled with waiting and headaches is now way easier. 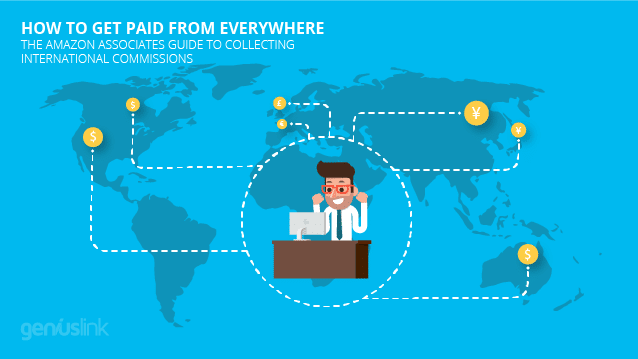 After a little bit of setup, you can easily be collecting international commissions from anywhere, including some remote beach on some tropical island. All it takes is a Payoneer and Cuelinks account and a little handiwork. Good luck and please don’t hesitate to share your experiences and questions in the comments below. *- It’s important to note that both Payoneer and Cuelinks offer affiliate programs and we are participating in them. The signup links above are affiliate links and by no way impact the taxes or fees associated with using either service.